The tents at Lobolo Camp are modern and comfortable, with electricity, as well as en-suite bathrooms that feature showers and flushing toilets. Although the tents’ design is somewhat utilitarian, they fulfill their purpose wonderfully. Each tent has its unique remarkable varied view of the sandy beach, the lake, Central Island and the distant shoreline. The atmosphere of Lobolo Camp is relaxed and unrushed, with hosts Joyce and Jogi eager to make their guests feel at home. Food is served under a tent on the beach and is hearty rather than fancy, but is surprisingly good, given the remote location. 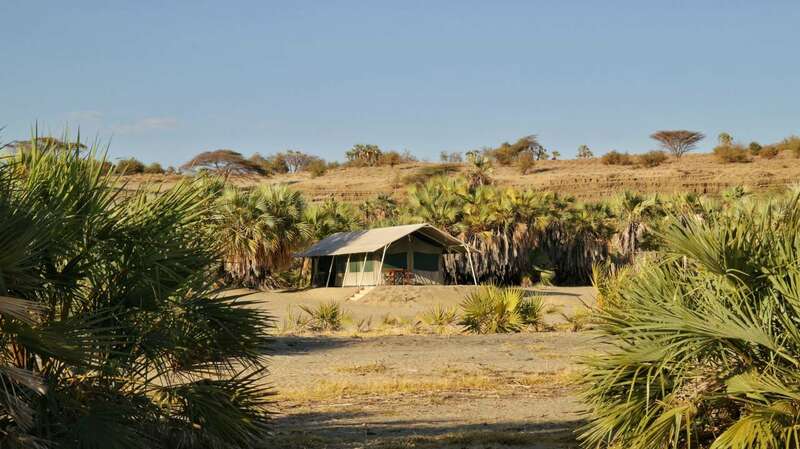 The hot daytime temperatures of the Turkana region limit activities, with nature walks taking place during the morning and boat trips during the late afternoon. However, the camp is best visited by helicopter, which allows far more scope for exploration. Everything about the Lobolo Camp is designed with the harsh conditions in mind. The rather functional-looking beds epitomise this approach. Ingeniously raised slightly higher than normal, this extra height places the mattress at the level of the mesh windows, which means the night breeze flows over you as you sleep. Explore Lobolo’s forest and spring, spot unique birds as often you will sight visiting migratory species. Relish the unspoiled beach and climb the cliff which is a backdrop to the camp and marvel at the panoramic view of the spectacular combination of features before you that can only be experienced and cap it with a sundowner atop the cliff.